The present tense is the most simple and also the most important tense when learning German grammar. It is not only used to express what you are doing at any particular moment, but also to express things that you regularly do and even things that will happen at some time in the future! As you can see, the present tense is a very important tense. Below you will learn more about the use of the present tense, but first I will explain how to form sentences in the present tense. When you form a sentence in German with the present tense, first you need the infinitive. This is the most basic form of any German verb that you will find in every dictionary. As you can see in the diagram above, the infinitive is formed form a so-called “present-stem” (in this example: lern-) and the infinitive-ending (-en). If you want to use a verb in the present tense, you must conjugate the verb. “Conjugate” is a technical grammar term; it simply means that you must exchange the infinitive ending (-en) with one of six endings. The particular ending that you use is determined by the subject of the sentence. Depending on the subject, the verb will take one of six endings; three of these are in the singular and three are in the plural. 1st. person: The subject is always the personal pronoun “ich”(I). The verb ending for the first person is “-e”: therefore “Ich lerne Deutsch” (I learn German.). 2nd. person: The subject is always the personal pronoun “du”. The verb ending for the second person is “-st”: therefore “Du lernst Deutsch” (You learn German.). 3rd. person: The subject can be one of these personal pronouns; “er” (he) is the masculine form, “sie” (she) is the feminine form and “es” (it) is the neutral form. In the third person singular, any noun in the singular can also be used: “Mein Freund” (my friend), “Paul”, “der Stuhl” (the chair) and so on. The verb ending for the third person is “-t”: therefore “Paul lernt Deutsch” (Paul learns German.). 1st. person: The subject is always the personal pronoun “wir” (we). The verb ending for the first person is “-en”: therefor “Wir lernen Deutsch” (We learn German.). 2nd. person: The subject is always the personal pronoun “ihr” (you). The verb ending for the second person is “-t”: therefore “Ihr lernt Deutsch” (You learn German.). As you can see, if you are learning German and want to form sentences in the present tense, you have to learn these six verb endings: -e, -st, -t, -en, -t, -en. Cheese! At this point you might be a little worried that it’s all too complicated. But there’s no need to panic! In the following video I will show you a fantastic learning technique, which will make it easy to learn these conjugated verb endings. 1. To say what you are doing at any particular moment. 2. To express things that you regularly do. 3. Speaking about the future. From this you can see that it doesn’t make a difference whether you’re talking about an event in the near future (tomorrow, next week, etc.) or an event that will occur in the distant future (in ten years or even longer). In general we use the present tense, when we are speaking about the future. 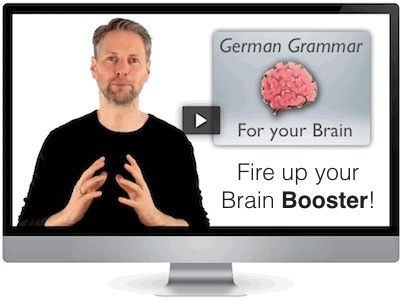 If you have enjoyed this page about the present tense in German and you want to learn more useful learning techniques, I would recommend my free five-days video seminar “German Grammar for your Brain” to you. Simply click on the link below.